This thick, hearty dish was (and still is) a very popular dish among herdsmen in Hungary. This peasant dish got on the table only towards the end of the 19th century. Restaurants started to put goulash on their menus to. By the second half of the 20th century the soup became the number one dish of Hungary. It got this name because the herdsman of Hungary often travelled far from home on horseback with their sheep to find better pastures on the Hungarian plains. At nightfall the herdsman’s would build a fire, slaughter an animal and then cook it for several hours in a large pot hanging over the fire known as a bográc. 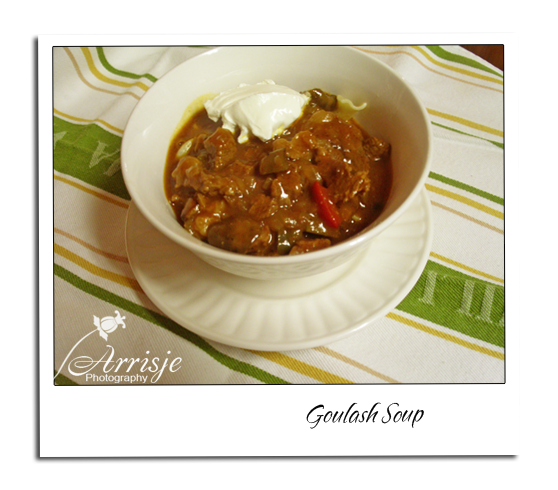 There are many different ways of making goulash, as it is with every dish. Goulash can be served with potatoes, dumplings, spatzle, or just as a stand-alone dish with bread. In a large pan saute the onion in the olive oil, add 1 tbsp of sugar to caramelize the onion. 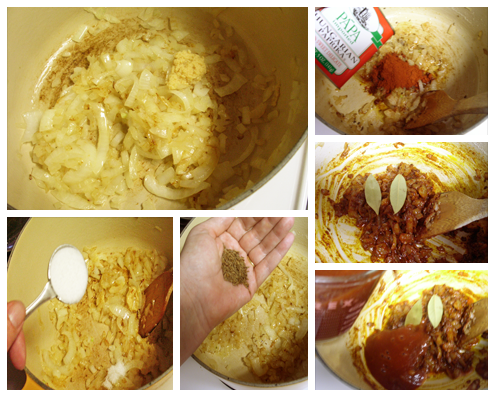 Then add the caraway seeds, the Hungarian paprika, bay leaves and the tomato sauce. Add the chicken or beef broth. It’s just my personal preference to use chicken broth. Add the cut up beef to the pot and add the salt and pepper. Simmer for about 2 hours. 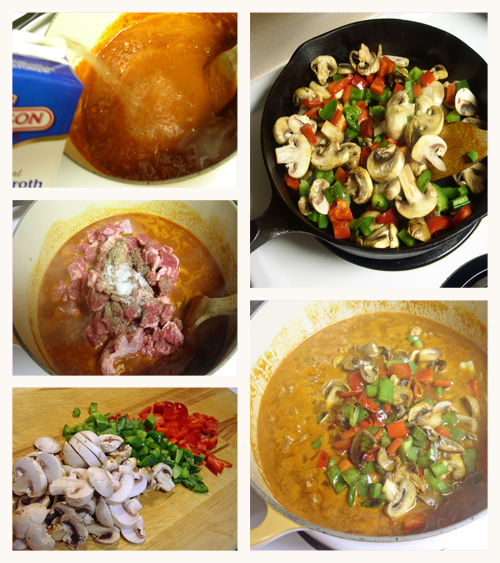 In a skillet cook the mushrooms and bell peppers add the cooked veggies to the pot right before serving. . If you like your soup thick add some diluted cornstarch. And top it off with a tbsp of sour cream. Add the chicken or beef broth. It's just my personal preference to use chicken broth. Add the cut up beef to the pot and add the salt and pepper. Simmer for about 2 hours. In a skillet cook the mushrooms and bell peppers add the cooked veggies to the pot right before serving. . If you like your soup thick add some diluted cornstarch. And top it off with a tbsp of sour cream.